Jorgensen Laboratories, Inc. announces an innovative concept in endotracheal tubes. JorVet has launched SAFE-SEAL ENDO TUBE, clearly changing the scope of safety in anesthesia procedures. The new SAFE-SEAL ENDO Tube utilizes a series of silicone baffles to replace the inflation cu. It eliminates the risks of over inflation, under inflation and leaky tubes. The soft, flexible baffles seal the trachea without pressure and cleanses the trachea of all fluids upon extubation. Only 4 sizes of tubes are necessary for dogs weighing 10 to 200 pounds. The ET tube’s one piece construction of medical grade silicone is autoclavable. Safety, longevity and cost effectiveness place the SAFE-SEAL ENDO TUBE in a world apart from the others. 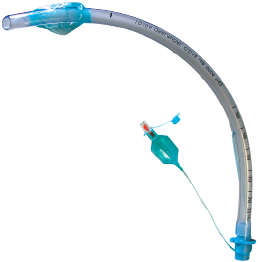 Almost all ET tubes used today depend upon an inflation cu to seal the tube in the trachea, except the Safe-Seal™ ET tube featuring the Blaine Bafflex System. 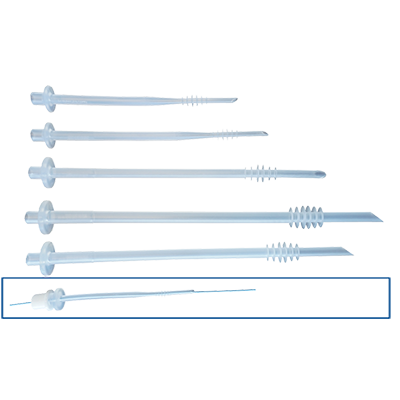 This technology uses a series of 6 silicone baffles with carefully engineered pattern and spacing to seal the trachea without pressure points. The flexible baffles allow an “o-ring effect”. The Safe-Seal ET tube lies in the trachea and the sealing baffles touch the tracheal wall leaning towards the larynx. Thus, when the patient inspires the silicone baffles are sucked against the trachea forming a tight seal. The special design allows passage of pressure exceeding 20-30 centimeters of water in the patient’s lungs. If the pop-o valve is accidentally left closed, the excess pressure is released and no harm will come to the patient. If more than 20-30 centimeters of water pressure is desired, the tube is merely withdrawn 1/2 inch causing the baffles to ip over and the tip will then face caudally thereby allowing as much pressure to be applied as deemed necessary. These soft, flexible baffles are atraumatic to the tracheal surface due to the limited contact of the baffles. 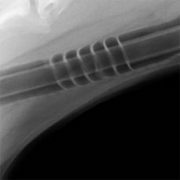 There is minimal contact with the tracheal wall when using the Safe-Seal tube as opposed to the large area of contact of inflation cu tubes. This means the tube can be left in the same position for extended periods of time. Another advantage is the “squeegee” effect when extubating, by sweeping the trachea clean of any fluids present. The Safe-Seal ET tube with the Blaine Bafflex System eliminates dangers of deflation or over inflation. The standard tubes used today are constructed of rigid, curved plastic. This shape and rigidity forces the tip of the tube against the tracheal wall when inflated, causing a point of pressure. The Safe-Seal tube’s baffles keep the tip of the tube centered in the trachea. It is ultimately safer to use and can cause no damage to the trachea. Complete with stylet which is necessary for use.